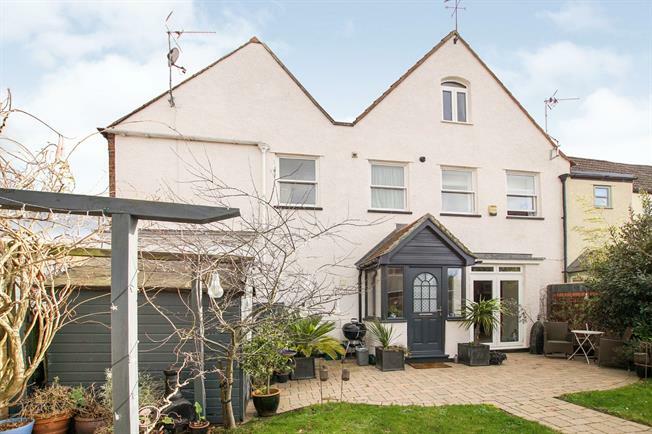 4 Bedroom Terraced House For Sale in Berkeley for Offers in excess of £375,000. OPEN HOUSE SATURDAY 6th APRIL, APPOINTMENTS ONLY. TO ARRANGE A VIEWING PLEASE CALL 01453 542288. Built around 1752, Laburnum House, Coach Close, is a deceptively spacious character townhouse set over three stories, just off the historic main High Street in Berkeley. Within 5 minutes walking distance of Berkeley Castle, and the surrounding deer park /countryside, the house is perfectly located for country living and for long walks. Berkeley also benefits from having a good range of local amenities, primary school, doctors, pubs and eateries. The A38 and M5 motorway networks provide excellent commuting routes to the larger centres of Bristol, Gloucester and Cheltenham. There is a main line train station at Box Road, Cam serving Bristol and London (Paddington) via Gloucester. The house has, due to the walled garden, a private feeling to it, and despite being close to the High Street is barely overlooked by any surrounding properties due to the positioning. Fully renovated to a high standard around 15 years ago, and with only one owner since then, the house has been carefully maintained, with additional internal and external improvements in the last 2-3 years. The home combines contemporary living standards with original character and charm. It is a property you need to visit to appreciate the warmth and character fully, and to appreciate the size, space and generous proportions of all the rooms which include high ceilings, a light and airy feel, 4 full sized double bedrooms and generous living space on the ground floor. The well balanced accommodation is arranged over three floors with ground floor comprising an entrance porch, a hallway with downstairs cloakroom off, and a large, light filled, 212 x 125 living room, plus 1711 x 1310 kitchen/ dining room. The living room has an open fireplace and French doors looking out on to the sunny garden. The garden catches the sunshine from midday through to dusk, facing fully West. The garden is landscaped with recently added sun patios to make the most of the good weather. Continuing downstairs, the hallway leads to a 1711 x 1310 kitchen, perfect for entertaining guests and the heart of the house. The flooring is the original terazzo Italian marble tiling. Leading from the kitchen are French doors to a private, sheltered 15 x 12 courtyard perfect for eating al fresco in the summer. The kitchen has fitted Bosch oven and hob and shaker style white units and plenty of space for a full size dining suite. The first floor consists of a large, light landing area, with a generous sized built in storage cupboard, and original exposed oak beam in the ceiling, which carries through into the second double bedroom. The master bedroom has a beautiful, recently added en-suite shower room, and double sash windows letting in plenty of light, and views down the old High Street. On this floor you will also find a full family bathroom. Continuing up to the second floor, you will note the original beams and vaulted ceilings, a small landing leads off to two further double bedrooms also with exposed beams. There is loft space and also built in storage in bedroom 3. These bedrooms have views across the town all the way to the River Severn to the front, and across to Berkeley Church at the rear. The property also benefits from a privately allocated off street parking space, double glazing throughout, and gas central heating, with an overall current energy performance rating of C.